Acoustic guitar pickup technology has changed dramatically over the past decade. L.R. Baggs has stayed at the top of their game with unsurpassed R&D leading to one of the highest quality pickup systems on the market today. Many of our guitars currently come standard with award winning L.R. Baggs preamps. Using internal mics as part of their systems, which include the Dual Source and more recently the Anthem, L.R. 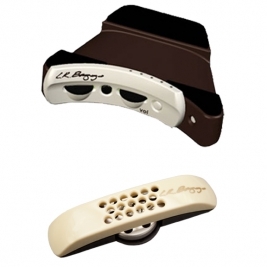 Baggs is constantly pushing the limits of acoustic pickup/preamp technology and never stopping short of sonic perfection. Founder Lloyd Baggs builds his pickups in sunny Nipomo, California, about 2 hours from our California shop. This side-mounted option provides easy battery access and a built-in tuner that is hidden beneath the control panel to maintain a clean, classy look. 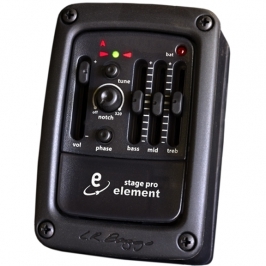 The mix control blends from the augmented TRU MIC position to Element pickup only. 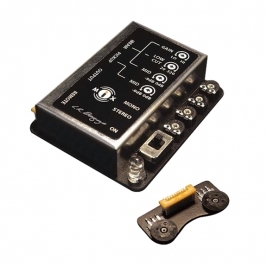 Bass & treble controls, phase inversion and a notch filter offer tone shaping along with maximum feedback suppression. 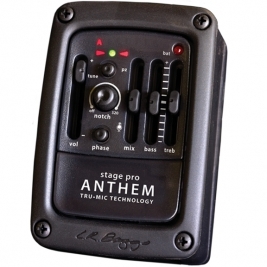 The Stagepro Anthem comes complete with the TRU•MIC and Element pickup. *This pickup system utilizes fingerwheel controls and does not have side mount slider controls.